Having well-defined job ad goals are crucial to your job ad success. After all, one of the most beneficial things you can do for yourself relative to hiring is to lay out specific job ad goals, so you can build a killer job ad strategy. We’ve found this step to be the most crucial for our clients to adopt in order to attract the highest quantity of quality applicants for their open positions. It also doesn’t cost you a thing! So you don’t have to worry about how to fit it into your already tight hiring budget. Having well-defined job ad goals are crucial to your job ad success. In today’s post, we’ll explore the best method for outlining job ad goals that are unique to your organization’s culture and needs for each opening. One of the most essential pieces to defining successful job ad goals is the realization that you cannot avoid the Internet. By now, you’ve probably realized that newspaper classifieds and help wanted signs are a thing of the past, but it goes beyond that. Not only is it a requirement to be online somewhere, but if you want to succeed at reaching individuals online, then you’re going to need to know how to navigate and understand how the web works if you have any hope of your job ad being found. In order for your ad to be seen, it needs to be optimized for the web and the mediums with which you’re looking to post your job opening. As a result, one of your job ad goals should be infusing your job ad with keywords, so that you have a better chance of it being matched with applicants. We’ve written about the essentialness of keywords pretty extensively, but in a nutshell, choose language that will be used by your job seeker, not what your company uses internally. In other words, instead of using abbreviations like pt and ft, type out part-time and full-time because your applicants are more likely to search for those terms. The more closely you can mimic the voice of your applicants in your ads, the more likely it is that they’ll find your job opening. One of your job ad goals should be to write an ad that demands to be read. One of your job ad goals should be to write an ad that demands to be read. Something that captivates your audience’s attention. There are many ways to go about this, but one of the easiest methods for resurrecting a dull ad is to ditch the legal job description. Not only keeping it push applicants away because it’s boring, but the language is often convoluted and it confuses job seekers. If one of your primary job ad goals is to attract quality applicants to your open positions, then you should start by helping them gain a clear understanding of what their job entails if they are hired. Chances are, unless you’re an attorney and recruiting for one, legal-ease isn’t going to be a language you speak fluently, so why rely on it to convey the bulk of your message for that particular opening? Obviously, we’re not trying to downplay the importance of the legal job description, but rather suggesting that you either move it to the bottom of your job ad, or include a link in your ad that takes the job seeker to a pdf that displays all of the legal job related items. 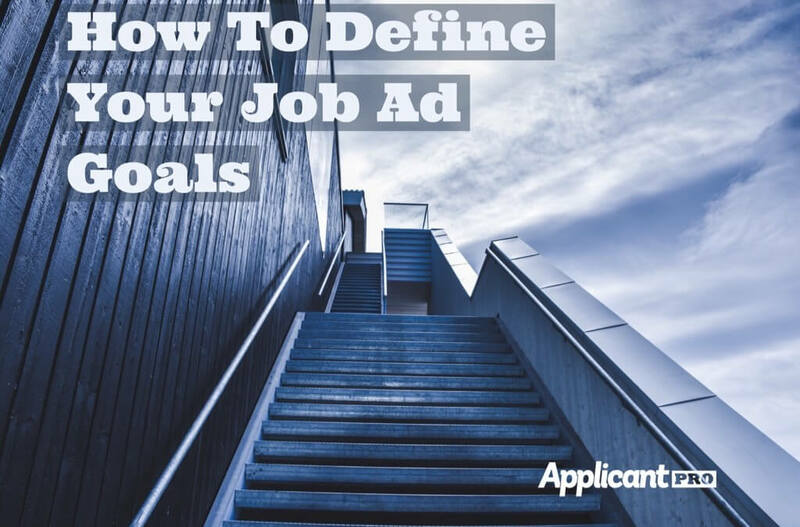 Don’t make it the core of your ad because that’s the quickest route to hinder job ad goals. One of the key job ad goals should be to convince applicants to apply. Statistically speaking, the more applicants you have apply, the higher your chances are for nabbing that perfect fit, right? So, spend time in your job ad explaining what’s in it for your applicants. The more benefits you share, the more likely it is that your candidates will get excited to invest their time into completing an application. Additionally, one of your job ad goals should include being thorough. You can achieve this by answering as many questions as possible in the initial ad. The more questions you answer, the better the applicant is able to gauge his/her fit for the position. Feeling too overwhelmed with all your responsibilities to build targeted job ad goals? Leave it to our hiring experts! We’ve helped thousands of clients write killer job ads and we can do it for you, too! Give us a call to get started. Want to learn how to write better job ads? Download our "Guide to Writing a Killer Job Ad" now! This guide will walk you step-by-step through the process of writing job ads that get dramatic results. * Please fill in your name. * Please fill in your email. "Guide to Writing a Killer Job Ad" is downloading now. Please stay on this page while download completes.